The pediatric implantable port market is expected to reach USD 0.91 billion by 2025, growing at a CAGR of 3.5% during the forecast period and the actual production is about 419 K unit in 2015. Light weight ports for patient comfort, availability of high quality imaging, power injectable, and presence of CT markers will stimulate business growth of pediatric implantable port market. However, high cost of treatment, low reimbursement policies, high risk of infection, insurance coverage discrepancies and risk of malfunctions are expected to impact the target market negatively. Market competition is not intense as C.R. Bard, AngioDynamics, Smiths Medical, B. Braun, Teleflex and Cook Medical are the leaders of the industry, and they hold key technologies and patents, with high-end customers; have been formed in the monopoly position in the industry. Titanium port body segment accounted for 64.1% of total pediatric implantable port market share in 2017 and the proportion tends to decline over the forecast period while plastic port body market have the growth potential over the forecast years. Application of pediatric implantable port in cancer dominated the market and accounted for 81.2% revenue share of the global pediatric implantable port market in 2017. North America region dominated the global pediatric implantable port market and accounted the market share of 52.1% in 2017 on the account of being major producer and consumer of pediatric implantable port, followed by Europe. The report covers the present ground scenario and the future growth prospects of the facility management market for 2017-2025 along with the market players’ analysis. We calculated the market size and revenue share on the basis of revenue generated from major players worldwide. 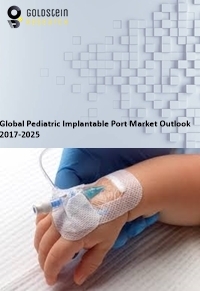 Pediatric Implantable Port market is forecasted on the basis of revenue analysis, product benchmarking and strategic developments of key market players. Global Pediatric Implantable Port Market Outlook 2017-2025, has been prepared based on an in-depth market analysis from industry experts. The report covers the competitive landscape and current position of major players in the Pediatric Implantable Port market space. The report also includes porter’s five force model, SWOT analysis, company profiling, business strategies of market players and their business models. “Global Pediatric Implantable Port Market Report” also recognizes value chain analysis to understand the cost differentiation, pricing models to provide competitive advantage to the existing and new entry players. Our Global Pediatric Implantable Port Market Report comprises of the following companies as the key players: C.R. Bard, AngioDynamics, Smiths Medical, B. Braun, Teleflex, Cook Medical, Fresenius Kabi, PFM Medical, Vygon, Districlass, Navilyst, PakuMed.